Japan's IAT displayed the largest number of EVs at the Beijing show. 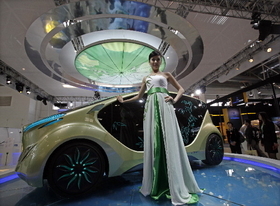 Pictured, a model poses next to an IAT Zu EV concept. BEIJING -- China has eclipsed the United States as the world's largest market for traditional vehicles powered by internal combustion engines. It may well become the world's No. 1 market for alternative energy vehicles, especially, electric vehicles. That is obviously what the companies participating at Beijing auto show in April have been anticipating. At the event, not only did every automaker display their EVs, several parts suppliers also joined to show their EV prototypes so as to demonstrate what they can do for automakers. At the Beijing show, Magna International Inc. set up a dedicated booth for its second generation Mila concept electric car. In January, Magna established its tenth field of competence, the E-car Systems Group, said Frank O'Brien, executive vice president of Magna's Asia region, at a press conference last month in Beijing. And one of Magna's plans for China in 2010 is to open an office in Beijing for the new business group, he said. According to O'Brien, Magna built its first electric vehicle for Fiat in 1989 and throughout the 1990s each year Magna undertook one or two electric vehicle development projects for its clients. "As you know, over time the interest in electric vehicles declined and increased depending on the prices of oil," he said. "Now we feel the up-and-down movement in interest has stopped and the world has found that the new era would be sustained interest and investment for the foreseeable future in electric vehicles." At present, the Chinese government is consulting Magna for the drafting of a series of technical standards for electric vehicles such as battery charging standards, said Sun Xingyuan, vice president of Magna Automotive Technology Service (Shanghai) Co.
Magna plans to open a Beijing office for its new E-car Systems Group. The supplier dispayed the Mila EV concept, shown, at the Beijing show. Visteon Corp. didn't have its own booth at the show, but it displayed its concept Q-e electric car at the booth of its China-based joint venture Yanfeng Visteon Automotive Trim Systems (YFV). The Q-e is jointly developed by Visteon with YFV and various subsidiaries. The car is said to be designed for young urbanite electric vehicle users. Its roof imitates traditional angular Chinese roofs and its sides are styled with highly structural lines. Its front and roof glass are embedded with 18 solar panels to generate additional "green" energy for the vehicle. Inside, the Q-e features a new concept of cockpit electronics interface system, the ACE-I, which allows for personalized driver interaction with vehicle controls including navigation, video, audio, driver information, climate controls, MP3 players, Apple's iPod devices and e-book Readers, and games. Visteon developed the Q-e electric car, shown, with its Chinese joint venture. "The unique styling of the Q-e also shows a deep understanding of the China market's consumers and trends," said Bob Pyle, general manager of YFV in a statement. The company that showed the largest number of electric vehicles at the Beijing show was not an automaker, but an auto engineering and design house, International Application Technology (IAT). Established in Japan in 2001, IAT has branches and subsidiaries in Beijing, Changchun, Tianjin and Shanghai. In April, it set up a 180 million yuan ($26.4 million) joint venture battery plant in Shanghai with Japanese battery maker Enax and China Automotive Technology and Research Center. One of the three concept EVs, the four-seat Bamboo Wind, has a top speed of 140km per hour and a range of 160km on a full charge, according to information IAT disclosed at the show.